#5159 found @ 12:55:00, cache 3 of 8 today, geostreak Day #307. Out for a fantastic day's caching around Ware, picking up some high DT caches by kayak (my first time) with Tot66 and Caliber2000, all three of us earning 4 new DT squares. We signed the logs as Team CCT or Team TCC, I can't remember! We also managed a secret nuclear bunker, a long tunnel cache and a couple of others thrown in for good measure. A fantastic day of fun, despite falling in the river! Going up this side tributary, we both had trouble negotiating the little dam which had been made by a tree falling across the water. 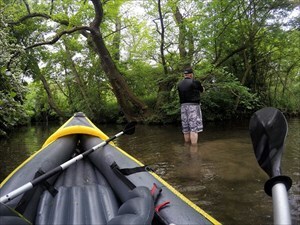 But a bit of pushing and shoving and eventually both craft were over it and paddling along to the cache. The overhanging trees were fun to negotiate. Once we arrived at GZ, I spotted the cache and we ran aground slightly! David decided the easiest option was to get out to sign the log - so he had a little paddle! David Gives Up And Wades!